Recently, I had a friend ask me how I got started in doll making. I found it funny as I thought about how I would answer her that I had never been asked that before. Well, let me rephrase that; I have but not quite as in depth. I normally get asked who I bought Lydia Ann from or questions like how long I have had her. Those types of questions do get part of my story as there answer but, not the whole thing. This whole “doll thing” started 6 years ago in 2011. It was late January and I was at a living history for a local civil war site in northern Florida. A friend of mine had a doll and I spotted it in her display. As soon as I saw her doll I knew I needed one! I was 24 and of course at this age a doll is a need. Yep, it’s a need. So after getting the contact information of the doll artist, I contacted her. I got the pricing for Lydia Ann and had to figure out how to afford her. Ok let me explain something to my loyal readers…….My husband (at the time) and I were working minimum wage. We paid our bills and were not starving but this doll would be a luxury. Luckily tax refunds would come along a few months later! That was my treat to myself. I then sent off the money and waited two weeks. Of course during those two weeks, time dragged on. It felt like a lifetime but she finally made it to my front door step! I am going to apologize at this point, I am getting long winded. But stay with me the good stuff is coming. I outfitted Lydia Ann from the skin out with scraps of fabric I had in my stash and my Mother in laws stash. She was my relaxation after work dealing with retail customer’s alllll dayyyyyyy longgggggg. After about a year or so of dressing her, I started traveling with her. Then I started her Facebook page(https://www.facebook.com/lydiaanntravelingdoll/) to share her travels. Everybody loved Lydia Ann’s adventures and continue to do so. Fast forward to 2015, I was traveling somewhere with my best friend. She showed me a magazine called “Dolls Beautiful”. It is put out by the Doll Artisans Guild(http://www.dollsbeautiful.com/). She saw they had a class for a doll she had admired and then I saw. I wanted her in my house! So we signed up and made arrangements to go to Atlanta, Ga to Sue’s Doll Studio. After taking that class, I felt encouraged to try my hand at more dolls. I also had caught the doll making bug. Yes folks, that is a real affliction. Be careful! You too will catch it! 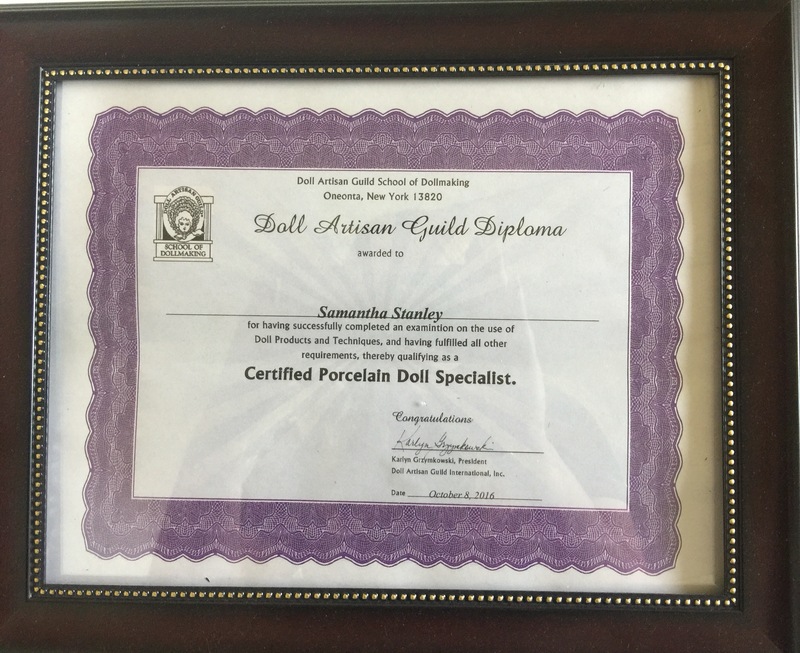 I found out how to become a doll artist because I felt why not get the credentials if I’m going to do this “doll thing”! I had to take apprentice I,II, and III. Then on top of that I had to take a test……and pass! Phew! At this point I had to keep going; I HAD to be able to make as many dolls as I wanted. What I really wanted to make was parian and china head dolls from the 1850’s and 1860’s. With each class, we made different dolls to learn new skills. If you ask Sue Mitchell, there were times I wanted to hurl my doll head at the wall. The two things that would get me so upset were “fancy” eyebrows (the kind with many, many tiny strokes) and eyelashes. I still don’t love either of them. After taking all three classes and extra courses to make sure I was confident in my skill set; I graduated in late 2016. Sometime in 2016 I went on a road trip to pick up my kiln and some doll parts. The trip took me all the way out to Ohio in pottery country! After months and months of working on my kiln (I swear I can be a professional kiln repair person now) all is up and running! That’s all folks! That is my story, well the short version at least. I didn’t want to bore anyone being long winded. Drop me a line if you have any ideas or questions or concerns. Take care! We love you and Lydia Ann! 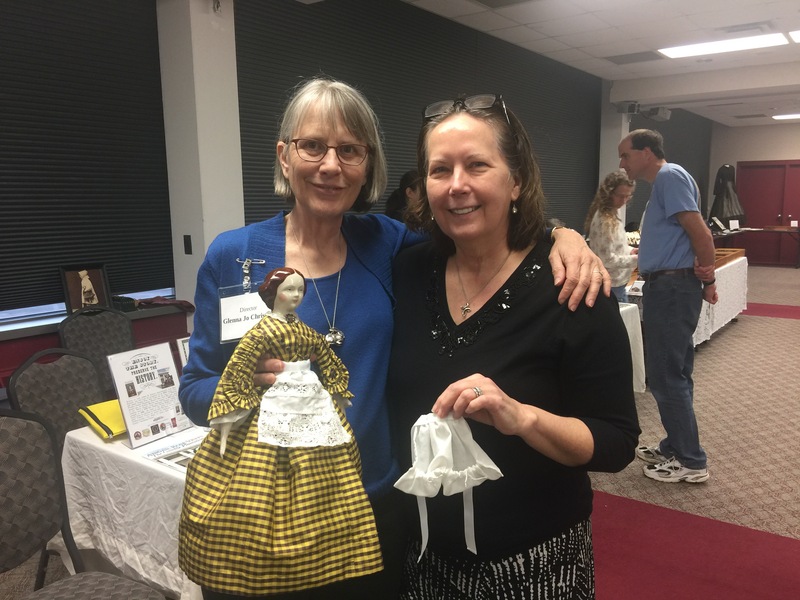 We especially love that you care enough to learn this craft, your work is detailed and accurate, and you are making it possible for others to own and appreciate historical reproduction dolls.